Our product range includes a wide range of venturi scrubber. Venturi Scrubbers System are scrubbers with a venturi shaped chamber with converging and diverging sections. Water is injected into the throat of the venturi through which the gas stream passes at high velocities. The energy from the gas atomizes the liquid, allowing particles and pollutants to be entrained in droplets. 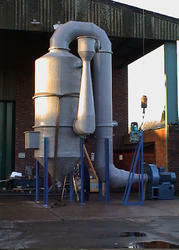 Venturi scrubbers have high collection efficiencies for particulate pollution and are simple to install and maintain.